Winters' Day In: Spot o' Tea? THIS week, I was staying up stupid hours, re-learning HTML so I could re-vamp my eBay listings (which I still have not finished), and catching Noah's cold for my efforts. THIS week, I didn't have time to blog, or to do anything particularly blog-worthy. 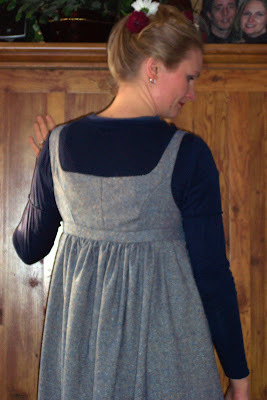 But LAST week, I made a new dress, which I love! I've always loved wearing dresses, and this winter I have discovered that I can wear dresses in the wintertime, too, if I layer up. I've taken a cue from those Regency women, with their chemises, stockings, pantalettes, and long gowns, and found I can stay cozy warm in the draftiest of houses! Thus, my typical daily fashion this winter has been tights, socks (often wool), pants (usually jeans) or bloomers (more about these in a later post), a chemise (I have one in linen and one in broadcloth--the linen is my favourite), a turtleneck or shirt, and a calf-length dress. Sometimes, I also put a cardigan over top. I was a little stunned a couple of weeks ago when I put on one of my favourite green calico dresses, which I have owned for eleven years, and discovered that it had actually worn out around the armholes (it was sleeveless)! I had already been planning a trip to the fabric store that day, and was thrilled to discover that they actually had a sale on--something that's kind of rare in our local fabric store. I picked up some poly-wool tweed for only $4/m. I knew already that this dress would be down to my ankles, and it would be inspired by the Regency styles I love so much. I was going for warmth, here. 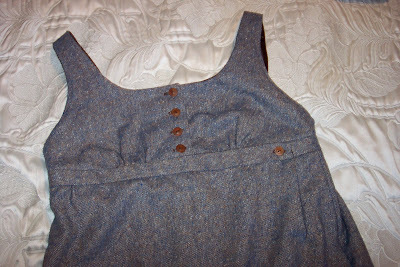 The photo above and below show the front closure on this dress. I was altering a pattern from Sense & Sensibility Patterns that actually had a black closure (but who wants a button-up back?!! Yikes! We don't have dressers and maids anymore!) 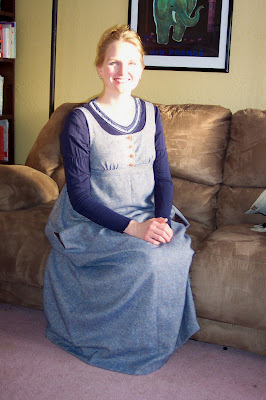 I styled this front closure after the style of many of the dresses in the 2005 Pride and Prejudice movie. I succeeded. This thing is like wearing a warm blanket. And nothing makes you feel more British than wearing a Regency-style dress in tweed! 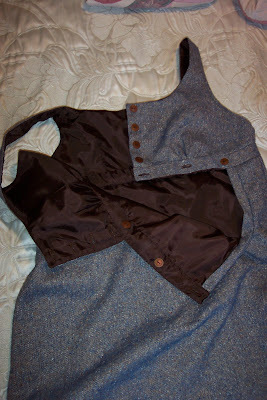 Maybe not the sexiest thing I've ever made--but it's modest, it's warm, it's comfortable and it does the job. And, most importantly, I like it!
" it's modest, it's warm, it's comfortable and it does the job." AND I LOVE IT! Good job Talena! I'm jealous of your talents! Dawn - Thanks! :-D D'you want one? Hee. B-EG - What? You sew! I know you do! But thanks--I know what you mean (I think)!